Many people are magnesium deficient and don’t know it. Magnesium is stored in our tissues which is why early deficiency symptoms are felt in muscle weakness, tremor and spasm. Only 1% of magnesium is found in blood so they don’t show up in blood tests. For effective migraine reliever, there must be intake of magnesium for relief. If you’re experiencing chronic migraine, check what you’re eating. Some of the foods that trigger migraine: Fried foods, sugar, artificial sweeteners, flour products, dairy products, alcohol, caffeine, food additives, chocolate and some nuts/seeds. Most fruits and vegetables are rich in three very important minerals that help remedy migraine, namely: Potassium, calcium and magnesium. Some foods that especially help: Dark green vegetables, bananas, cantaloupe, celery, cucumber, lemon, pineapple, watermelon, and ginger. This recipe makes one portion, multiply the amount to make more. This juice combo is two-fold in relieving migraine: It satisfies the deficiencies, and contains anti-inflammatory properties that help relieve the pain. Adding lemon to the juice superboosts and enhances the absorbability of the nutrients for rapid relief. Drink this juice till you find relief, and drink LOTS of water! Try the Migraine Buster juice recipe too! How long will this keep in the fridge if I make a big batch? Hi Treesha, it is best to drink the juices fresh daily. If not, try to consume within 24 hours to ensure total freshness. 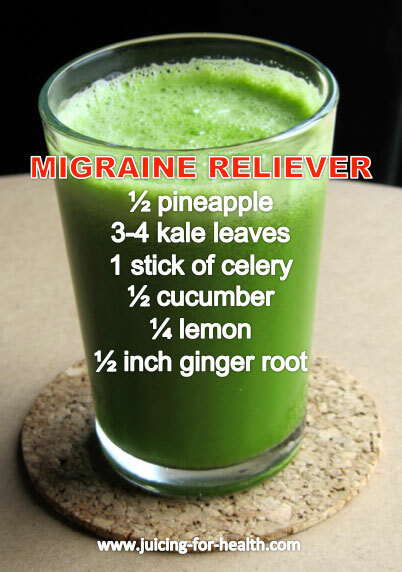 Your Migraine Reliever green juice recipe is just amazing. Hi Katherine, sure you can feature this juice recipe, as long as there is a credit link back. Thanks! What does it mean by 1/2 pineapple? Half a cup? Half of the entire fruit? Thank you. 1/2 pineapple is half of the entire fruit. Happy juicing!